The installation component of the exhibit poetically responds to traditional categorizations of feminine beauty as belonging in a domestic and intimate space. Formerly a 1920s car garage, the industrial gallery space is "domesticated" by hanging white fabric on its dark gray walls. The fabric patterns are reminiscent of wallpapers and create a nostalgic, salon-like setting. The installation of white fabric is also a play on traditional notions of "purity" and the white-cube gallery ideal. 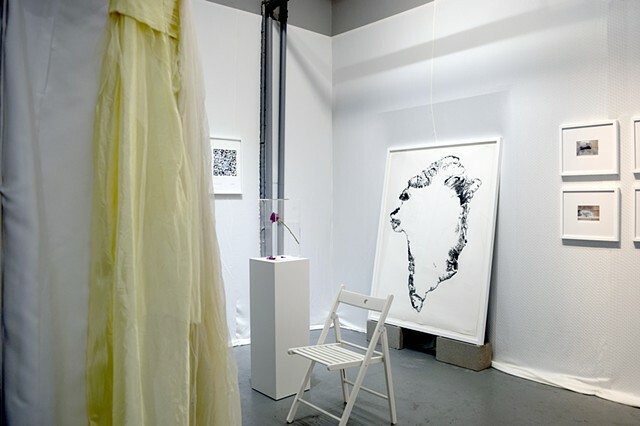 Each artwork is framed in white, emphasizing the use of large swaths of white space within each piece, further adding to the light and airy feel.The result is a dramatic and sensual transformation of the original exhibit space, its feminization serving as a counterpoint to the industrial architecture of the gallery. Seen from outside, the entire show has an ephemeral glow at night, highlighting the lace-effect created by gallery's garage gate. Furthermore, the installation of individual artworks throughout thoughtfully interact with the architecture of the space: Propped up on cinder blocks, the weight of the large ink drawing “Rise of the Greenlandic Metropolis” reveals a door that would otherwise be hidden behind the fabric, and the delicate laces, satins, and silks of the hanging sculpture “The Ideal Republic” play against the gallery gate in an interplay between soft and hard, light and heavy.